A father and son are thankful to be alive after a serious motorcycle crash in Guelph. Now, they're urging drivers to pay attention to motorcyclists. The quick ride to a family member’s house last Sunday took a turn for the worse in seconds. Police say a minivan turned left in front of the motorcycle, which is when Drew Haller and his son collided with it. They had spent hours before tuning up the vehicle together. Both were rushed to hospital. Drew Haller had a bad gash on his leg, while his 11-year-old son, Andrew Corneilse, suffered a concussion. 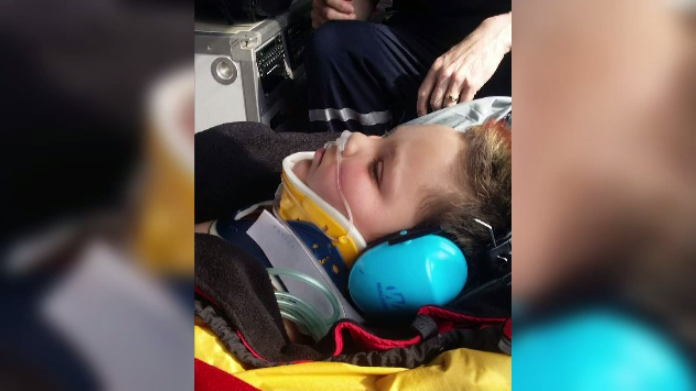 The boy was airlifted to hospital for treatment. “I took off my own belt and I wrapped it around my leg, and I hobbled over to the grass,” Drew Haller explains. He says a passerby stopped him from bleeding out as blood rushed out of his leg. Altogether, he had 22 stitches in his leg. “I was glad to hear my father being okay and I was glad to hear him alive,” Corneilse says. The driver of the minivan was charged with careless driving causing bodily harm. The pair is focusing on recovery right now, but both agree that they hope it isn’t the end of their motorcycle riding, a passion they share as father and son.